These businesses have survived this far, but they're fragile. Barcelona is about to get a new, different breed of protected monuments. They aren't churches, museums, or archaeological sites. They're a candle shop, a costumier, a drugstore, a café, and a herbalist. These sites, along with 223 more, have just been selected by a city committee as being worthy of special protection. When the plan is voted through after this year's election (and it's all but certain that it will be), these businesses will have extra planning restrictions placed on them that will make it effectively impossible to significantly alter their décor, and difficult to change their use. The idea of preserving commercial premises unchanged in perpetuity, like a fly caught in amber, might seem impractical, but some of the chosen sites are effectively monuments already. Among them is the classic café Els Quatre Gats, long famous for its decision to hire a then-untried artist called Picasso to design some artwork. 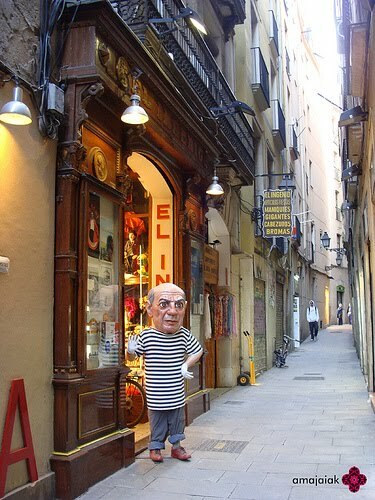 But across its older quarters in general, Barcelona is a treasure chest of old stores and bars of rare beauty and charm. Lined with old wooden cabinets, elegant tiles, polished brass, and florid signage (often in the art nouveau-esque modernista style Gaudí made Barcelona famous for), Barcelona shops can be as time-weathered and graceful as churches. They often house unique specialist businesses that not only attract visitors but foster a high degree of staff expertise—I rate the workers at soon-to-be-protected Barcelona hat shop Sombrerería Obach very highly for actually managing to find me a cap that didn't make my head look enormous. It's not easy to prove that turning a historic drugstore into a café would actually enhance it. Such businesses have survived this far, but they're fragile. Backstreet sites formerly considered a little louche by the wealthy are now right where tourists and the well-heeled want to be. The shops may still get specialist custom, but can struggle to match the rent that, say, a chain coffee shop could pay out easily. The temptation for landlords to evict is high, which is why Barcelona is planning to make that option a little less tempting. That said, buildings are the real focus of the new plan, not rents. While in New York and London, efforts to save long-standing small businesses have often focused on the rising cost of premises, Barcelona's initiative concentrates on their décor and furnishings. Any new tenant would be forbidden from altering signage or interiors, but changes of use would still, theoretically, be allowed. I say theoretically for good reason. Among the protected businesses will be an elite group of 32 where almost no change at all will be possible, unless it preserves or enhances what's already there. For prospective proprietors, it is not an easy job to prove that transforming a historic drugstore into a café would actually enhance it, which means the preservation of original specialisms is likely as long as there's some market for it. Not all controls will be this stringent, however. Another 152 sites, where historic décor has already partly been altered, will merely be prevented from further alteration. Finally, there is a group of shops that contain historical fittings now detached from their original design—the law will shield these fittings alone. The new law thus doesn't mean the dead hand of tradition will squeeze the life out of Barcelona's streets. It will just mean that Barcelonans won't have to walk past every single downtown chain store or restaurant and think, "I remember when this used to be… what was it again?"